Many people are concerned about animal conservation, and rightly so, but usually it is for the furry types like seals or large sea mammals such as whales. Amphibians that are small and thought of as slimy, tend to be forgotten about but many species are very much in danger and need our help just as much. Based in America and founded in May 2008 by Dr Kerry Kriger, Save The Frogs is a non-profit-making charitable organisation set up to give these fascinating creatures a chance at survival while we still can. Frogs are disappearing at an alarming rate from many parts of the world and we really do need to do something about this. As many as a third of the species are endangered with extinction and hundreds have already gone. This cannot be allowed to continue! Frogs used to be such common creatures. In my childhood nearly every pond had tadpoles and there were plenty of ponds about in the countryside as well as in parks and gardens in towns and cities. Sadly those days are long gone. Many ponds have been drained or the land used for other purposes. This has led to habitat destruction on a large scale. Another problem frogs face these days is from insecticides and herbicides. Insects are what these amphibians eat so cutting down in the numbers of their prey is bound to have a bad effect and any dying or poisoned insects that get eaten are not going to do the frog that eats them any good. Insecticides and herbicides get into groundwater as well as into ponds and lakes with a devastating effect on tadpoles and frogs. The Monsanto-produced Rounddup (Glyphosate) herbicide has been shown to harm amphibians despite its manufacturers claims that it does not kill wildlife. Another major problem that frogs face is having to cross busy roads to get to and from their breeding quarters. Millions are killed by being run over by traffic. An infectious disease known as chytrid fungus has spread all over the world too wiping out countless frogs. It is thought that this fungus gets spread from one habitat to another and then infects more amphibians. Diseased specimens that have come from the pet trade can be a source of this terrible problem. Often the frogs have weakened immune systems due to other factors, such as water pollution, and they then succumb to chytrid fungus that finishes them off and can destroy whole colonies. Another problem they face comes from non-endemic and invasive predator species of fish and other amphibians including larger bullfrogs that eat tadpoles and growing and grown frogs of smaller species. Over-collection by humans for food, for dissection for laboratories, and also for the pet trade have all had a terrible effect on frog numbers too. Climate change is also causing major problems by bringing drought to areas that normally had plenty of fresh water and by disrupting breeding cycles. This has been happening where I live in Tenerife. A winter and spring drought has caused ponds that normally fill at this time of year to be empty. 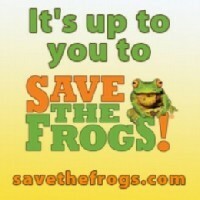 Save The Frogs is America's first and only charitable organisation dedicated to the conservation of amphibians. One of its main aims is to educate the public at large about the plight of frogs in the modern world. Many people simply don't know that so many types of these amphibians are endangered. So raising awareness about the issue is of prime importance. Dr Kerry Kriger, who is the Executive Director of Save The Frogs, has given very many lectures and presentations about the subject of frog conservation as well as having been a quest speaker on radio shows. Since 2009 at the end of April every year the organisation has held a Save The Frogs Day. The next one is coming up on 28 April, 2012. People all over the world are urged to join in in any way they can to help raise awareness about frogs and the dangers they face. In 2010 at least 104 events took place in 21 different countries. Save The Frogs is worldwide in its membership and scope. Save The Frogs wants musicians and celebrities to get involved too with benefit concerts and public events to help spread the word. This year on 28 April, as part of Save The Frogs Day there will be a Drumming For The Frogs special event in San Francisco. There are poetry and art competitions being run as well by Save The Frogs, so please see the website for more details.. There are many campaigns too including, trying to get restaurants and food suppliers to stop selling frogs legs, and to get the very harmful herbicide known as Atrazine banned. Atrazine causes frog males to change into females at concentrations as low as 2.5 per billion. Another threat to frogs is caused by them being collected for use in laboratory experiments and to be dissected in schools and colleges. Save The Frogs is of course campaigning against these practices. And of course it is not just frogs that are endangered because other amphibians face the same problems. Toads, newts and salamanders are all declining in numbers fast in many places and species are becoming extinct. Save The Frogs is raising awareness about and doing what it can to help these animals too. There are many ways to help save frogs and other amphibians. If you have a garden then you can install a pond and provide a home and breeding place for any species that live in your neighbourhood. I once did this successfully using an old bath that had been thrown out. I dug a big hole in the lawn in my back garden and it soon became a place where frogs and newts too would gather in spring. In many places in the UK and the US, people organise Toad Patrols to help move the amphibians across roads at night when more of them are in danger of getting run over. Toads are under threat in particular because their instincts make them return to the `ponds and lakes they were born in. This is where they must return in order to reproduce. If roads are in the way they must still get to their destination. In many places too, special tunnels have been made to go under roads and hopefully get as many frogs, toads and newts from one side to the other safely. Of course, the amphibians do not understand that danger awaits them on the road so this method is not ideal and really needs some sort of fencing to force the creatures into the tunnels. People all around the world are coming up with ideas for ways of helping local frog populations. It really is a worldwide effort! If you are a farmer or landowner then please don't use harmful herbicides like Roundup and Atrazine, especially in the vicinity of freshwater habitats. 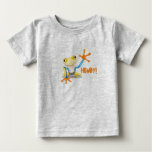 Save The Frogs also has a wide range of Frog Gifts, including t-shirts, bumper stickers and postcards. You can also help the charity by buying any of this merchandise and by taking out a membership. Or simply make a donation. Save The Frogs is willing to receive any and all offers of help so take a look at the website and get in touch! We must do what we can to help protect the world's amphibians. The croaking of frogs in spring is one of the joys of the season just like the singing of birds! And sadly this is the case in so many places! I now live in the area where I grew up, which is surrounded by woodland. When I was a child my friends and I used to play in the woods and there were tons of frogs, but in the past seven years of walking my dog in the woods I haven't seen a one. Such a shame! Seven years ago I moved to the home that I now live in. I grew up in the area and there's a vast space of woodland on the outskirts of the town. When I was a child we used to play in the woodland and there were tons of frogs, sadly, in seven years of walking my dog there I haven't seen a one. Such a shame! Thanks for your comments, Brenda! You're right. There were always frogs around when I was a kid too. Tenerife a subtropical island in the Canary Islands but it is still possible to create a water garden in your garden and to view these in parks.